A revolution of sorts is currently underway with more architects returning to bricks to reimagine a built environment that has a more tactile expression and quality, a departure away from painted precast concrete which lacks neighbourhood character. More recently this has been evident in the Nightingale Village project of which Kennedy Nolan are also involved, combining brick with other robust domestic materials which reflect the vernacular and material qualities of their context. Lothian Street's brick work is a nod to curves and craftmanship, while the brick colour has been custom blended to achieve an individual character that harks upon the past. 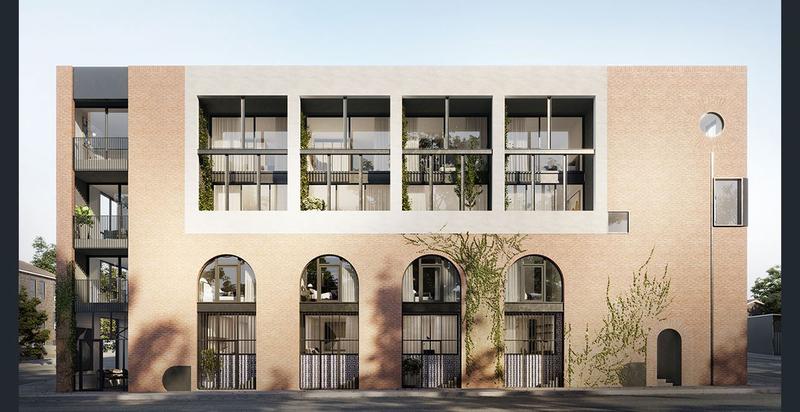 Krause Bricks have been working closely alongside Kennedy Nolan to create an exterior brick form which sits comfortably within its North Melbourne streetscape. A family business established in 1945, the Krause family has been building a successful, succession-based business and has evolved to meet the challenges, changing fortunes and fashions, of the Australian brick industry. With only 11 employees, Krause Bricks have three kilns that are firing constantly, outputting a staggering four million bricks per annum. Grandson, Klynton Krause who works with father, Patrick, sees brick with new eyes. Klynton has been working alongside architects creating specific brick solutions and welcomes the challenges of a new market. Bricks are indeed booming as industrial suburbs are being gentrified and architects are looking to provide buildings which draw on the qualities of industrial red brick warehouses. This is a far cry from from the golden ‘clinker brick’ homes of yesteryear, which are so synonymous with Australian suburbia. Other collaborative design elements include decorative porcelain tiles used throughout the entranceways, designed and printed locally by Bonnie and Neil, timber door hardware from IN-TERIA and lighting from Daniel Emma. The use of local artisanal collaborators has ensured Lothian Street has an authentic, individual design quality that is more than just the sum of its parts. Lothian Street is a love project for Excelon. The process of working with local collaborators to create something unique for North Melbourne has been a joy, and it’s exciting to see the project unfold as it has. It is always our absolute pleasure working with local Australian manufacturers and artisans such as Krause Bricks. With their understanding of the medium, I believe local collaborators impart a sense of soul into a project as they are passionate about their craft. We work alongside architects which is an opportunity to provide a true one off brick project. There is no one size or colour fits all with bricks. It is very much a product designed to the specifications of every design and every location. Brick is now a material that is pushing design boundaries. It’s such a humble product and you see it everywhere but there is such innovation that can be had, I work with a lot of different architects. They can throw curveballs at you, and I love that challenge. It enables us to watch the quality side and really achieve that Australian, handmade product. Our secret to success is to welcome the challenges that come to us. I am focused on developing a truly unique bespoke building outcome with every Krause brick product. Working with local manufacturers and artisans adds authenticity to our projects. Krause Bricks are a Victorian family business and their products are made from Victorian clay meaning that Lothian has a physical, economic and emotional relationship to its place.